Are you struggling to communicate effectively so your target audience understands, accepts and then acts on your key messages? 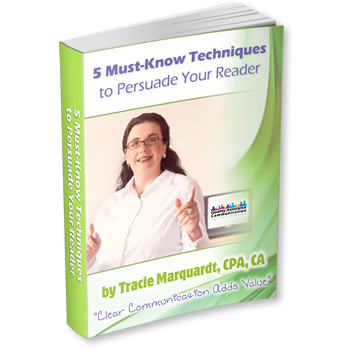 Get your free copy of my e-book, 5 Must-know Techniques to Persuade your Reader. Here, I give you the proven tools and techniques I have perfected to empower you, a quality assurance and finance professional, to be heard in a global environment. This is a FREE GIFT from ME to YOU! Tips on how to avoid roadblocks that limit your ability to write clearly and concisely. Get your copy right now by filling in the form below!